Please select the country where you are currently from. New embassy locations are added regularly. Existing embassy information are updated regularly. If you think the information is not accurate or the location of the embassy has moved to a different location, please email us with the updated information and subject “Thai Embassy Information Update” to info@siam-legal.com. 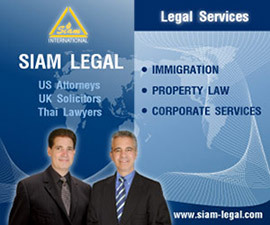 Siam Legal offers comprehensive legal services aimed at ensuring you a hassle-free entry into Thailand's business market. Get in touch now and get started on your business or company registration application.